Congratulations! You've earned a 'Recommended on TripAdvisor' sticker! Travellers are impressed by your business and service standards — and it shows in their reviews. We're recognising this impressive accomplishment by presenting you with a coveted 'Recommended on TripAdvisor' sticker. 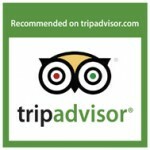 As only 3+ rated properties will receive this TripAdvisor accolade, we hope you'll display your sticker with pride for customers to see.